Holiday apartment with pool, close to the beach in Cannes. Tourist apartment close to Plage du Midi, with pool and balcony to the south. A very pleasant and child friendly apartment close to the beach as well as to the town centre, perfect for holiday and congress. Two rooms (bedroom and a kitchen and living room combined), a small hall, toilet and bathroom. Suitable for up to four persons. In the living room you find the click-clack sofa-bed for two persons, lounge table, a stool, dining table with four chairs, bookcase, stereo, DVD-player and a TV. 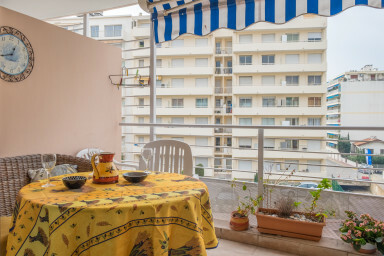 Balcony with a dining table for at least four persons. Partly sea view and a view to the Esterel Mountains. Even if the apartment is located in a “traditional” apartment hotel, this apartment is something else. This is the owners second home you will be renting. The apartment is located just off the Plages du Midi, just a few minutes walk from the Old Town of Cannes and the Palais des Festivals, Croisette, the beaches and all else that Cannes and the Riviera has to offer. On the way to the beach you'll find a little nice park Square Mistrale. A short 3-minute walk takes you to Plage du Midi where you will find a well-managed public beach. You will also find sections of the beach where you can rent a parasol, a mattress, etc. From the beach to the Palais des Festivals and further via the Croisette you will find a large number of café, bars and restaurants in a different price class. If you want to start the morning with new baked bread, fresh vegetables and fruits, quail eggs, cheeses, etc, you can go to the city's main market, Marché Forville, which is open every day of the week except Mondays. Just a 10 minute walk from the apartment! The colorful floral market of Allees de la Liberte is located near the Marche Forville and offers freshly cut, seasonal blooms. Vi trivdes bra i den lilla lägenheten som är väldigt nätt i formatet men ändå rymmer det mesta man behöver. Balkongen med havsglimt och poolutsikt var dessutom väldigt trevlig. Bra badrum och trång toalett. Köksdelen var tillräckligt stor för att man skulle kunna laga "riktigt" mat. Ett minus var att kylskåpet trots lysande lampa var avstängt, något som inte upptäcktes förrän nästa dag.